Attention e-commerce Professionals - Let's meet in Dallas! 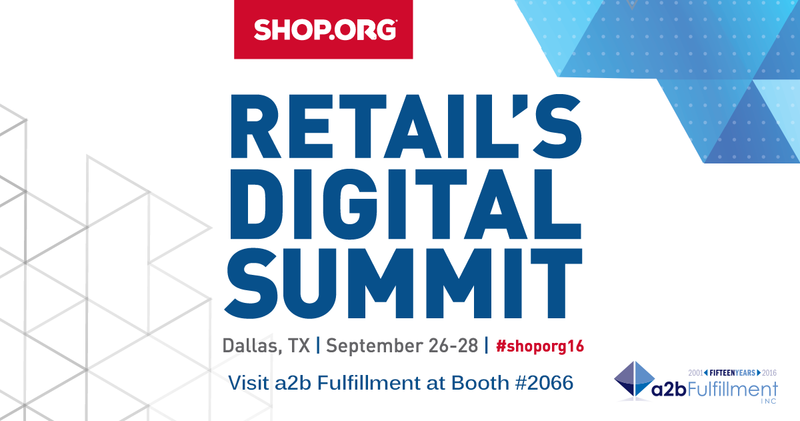 a2b Fulfillment is excited to be joining the more than 5,000 e-commerce professionals attending Retail’s Digital Summit in Dallas, TX, September 26th-28th. Presented by Shop.org, the event helps attendees discover new ideas, get actionable takeaways and build strong relationships with the brightest and most innovative players in the digital retail world. For those that happen to be attending the event, we’d encourage you to make an appointment or drop by to see us at Booth #2066! We are excited about having the opportunity to share with all of the e-commerce professionals the capabilities that our company has to offer with regards to e-commerce order fulfillment. We Ship Smart – Majority of US Consumers Can be Reached in 2 Days or Less via Ground Service. Learn more about the benefits of our e-commerce Fulfillment solutions here. We’re Run on Powerful, Enterprise Technology – Easy Integrations, Advanced Order Management, Inventory Control Systems, Shipping Intelligence and Call Center Routing and Monitoring. Learn more. Our Goodness Leads to Your Greatness – 20 Second Speed-of-Answer, 48 Hour Dock to Stock, 99.9% Inventory and Order Accuracy, Same-Day Order Fulfillment, Secure and Pristine Facilities, PCI DSS Certified Order Management, 48 Hour Returns and Refund Processing. Be sure to download our latest brochure which walks you through some of our common solutions. Take some time to review, then reach out to us to tailor a custom solution that fits your business.